Problem 3.22. (a) Plot the following objects on a copy of Fig. 5 and determine by inspection the galactic coordinates of the objects as best you can (e.g., to about 20° precision, though in some instances one can do better): the Crab nebula at a (B1950) = 5 h 32 m, 8 (B1950) = +21° 59', the radio galaxy M87 (12 h 28 m, + 12° 40'), the nearby Andromeda galaxy M31 (+0 h 40 m, +41° 00'), and the central star in Cassiopeia called Gamma Cas = 7 Cas (00 h 54 m, +60° 27'). (b) Program your calculator (or the equivalent) with Eqs. 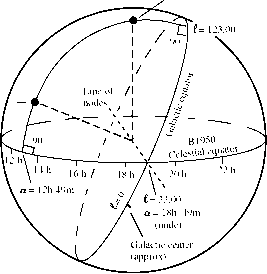 (6)-(10) to obtain accurate values (to about 0.1° precision) of the galactic coordinates of the above objects. Pay attention to the signs of your trig functions. (c) If an astronomical plastic globe with celestial equatorial coordinates indicated on it is available to you, determine the above answers by making measurements (with a piece of string) along the surface of the globe. Your answers should be good to about 2 or 3 degrees. Problem 3.41. Compare the problems you would encounter in trying to keep track of the positions of all the trucks in the United States as time progresses with the problems facing astronomers in keeping track of all stars as time progresses. Problem 3.42. Use Norton's 2000.0 Star Atlas as a finding chart for the bright naked-eye objects. Locate a constellation of interest to you, e.g., Orion, on the star chart and pick out a faint 5th or 6th magnitude star near one of the bright stars on the sky map. Try to find it with your naked eye or with binoculars. 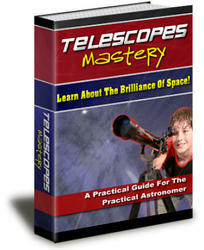 Do this on a dark night (moon set) away from city lights if possible, and be sure to let your eyes become dark adapted. (Use a faint red-light flashlight when examining the catalog.) Find the Orion nebula, labeled 42M for Messier 42, in the sword of Orion. Can you see its nebulosity with binoculars? Mount your 35-mm camera on a tripod and take several time exposures with the focus at infinity and the aperture wide open. Try exposures: 1 s, 10 s, 60 s, 90 s, 2 min, 3 min, 5 min, 10 min. Can you see more or fewer stars in the photos than with binoculars? Do the lengths of the tracks in the prints match the rotation rate of the earth?